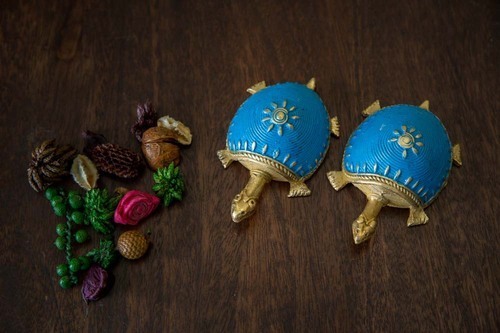 This pair of tortoises made of bell metal makes for an attractive piece of home or office décor. Keep it for yourself or gift it to someone you love, it oozes a positive vibe and transforms the space completely. Available in five eclectic colours, choose the one that fancies you. Disclaimer: Given that this product is handmade and intricately designed; there may be slight variation in the design, texture and color of the actual product than shown in the image. Such variations are inherent in the manufacturing of handmade products. Please do not consider this as a defect or a wrong delivery. Olha-O, a brand of Ethical & Sustainable Young Indian Entrepreneurs Pvt. Ltd., recognizes the importance of preserving the Indian heritage of handicraft skills. In this endeavour, Olha-O has identified a special art form from a small village in India that has its own unique style, manufacturing process and design. The art form, commonly known as Dhokra art, consists of the beautiful hand-crafted products made from Bell metal. Dhokra art has its origins from the region of Bastar, Chhattisgarh and has been registered under Geographical Indication (G.I. Application Number 83). In addition to the most famous handicraft from this state, Olha-O also promotes two more exquisite handicrafts i.e., Tumba and Wrought Iron art from Bastar region. By promoting these art forms, Olha-O has embarked upon the journey of offering the world, unique handcrafted products, while providing better economic opportunities to the craftsmen. Olha-O believes in 100% customer satisfaction and it is our endeavour to develop a long lasting relationship with all our customers. We invite you to explore the exclusive product range and add a touch of Indian heritage to your lifestyle.